Snacking is something I am guilty of and it's usually the naughty snacks, so I've been testing out healthier alternatives that are supposed to be filling and tasty. 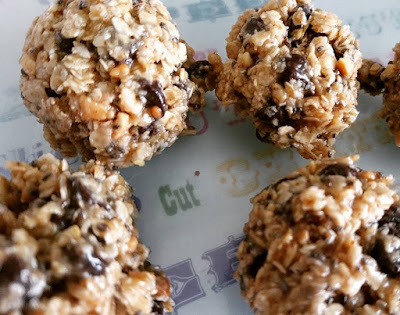 This week I have been eating these no-bake energy balls after seeing various recipes on Pinterest and creating my own version to suit my tastebuds. I've been having one or two of the energy balls as snacks and they taste quite nice. They do seem to fill me up and half an hour later I have a bit more energy which is most definitely welcome! Mix the ingredients together, then chill in the fridge for 20-30 minutes. Get an ice cream scoop or spoon and use these to scoop and shape the energy balls. Keep them in the fridge, and you can always freeze half the batch to save you making them too often. These look nice and no bake sounds just great! Oh yes! These look great! I need plenty of healthy fats and I bet these would be ideal. Thanks for posting the recipe! They look and sound great! And have the magic words "no-bake" also! These look great for a lunchtime snack at work.